The great news: AMC’s Breaking Bad, otherwise known as one of the best TV shows of all time, will soon be back on the air and primed to routinely blow our minds. The bad news, though: Not only is the fifth and final season, but it’s going to be split up into two shorter, eight-episode runs both this summer and next year’s warm weather season. Yes, come the end of August, we’ll have to wait a full 12-month span yet again. Of course, that’s a small price to pay for Breaking Bad’s caliber of superlative storytelling, courtesy of the venerable Vince Gilligan and his gang of top-notch writers. Heading into his last days (on the air, at least—not fatally…right? 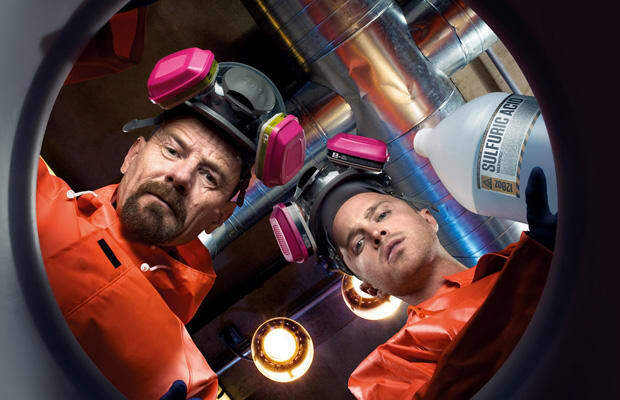 ), cancer-stricken crystal meth mastermind Walter White (Brayn Cranston) is now, for lack of a better word, “the man,” having blown Gus Fring’s (Giancarlo Esposito, who better get an Emmy nomination) face off and manipulated Jesse Pinkman (Aaron Paul) into rejoining his side. Being that it’s Breaking Bad, though, Walt’s streak of good fortune will no doubt last about as long as Walter Jr.’s (RJ Mitte) screen time per season. Recently, Friday Night Lights star Jesse Plemons was announced as the show’s newest cast member, playing Todd, “a dependable, innocuous, working-class guy… [who] may not be what he appears to be.” Meaning, he’s about to make Walt and Jesse wish they were still dealing with Mr. Chicken Man Fring? Hopefully so, since, as any Breaking Bad viewer knows, Gilligan and company are at their best when matters in Albuquerque, New Mexico, are at their worst. —M.B.